At The Blackback we are all about the beer. It is the reason we are here. We proudly cater to the many beer fans from all over the world. 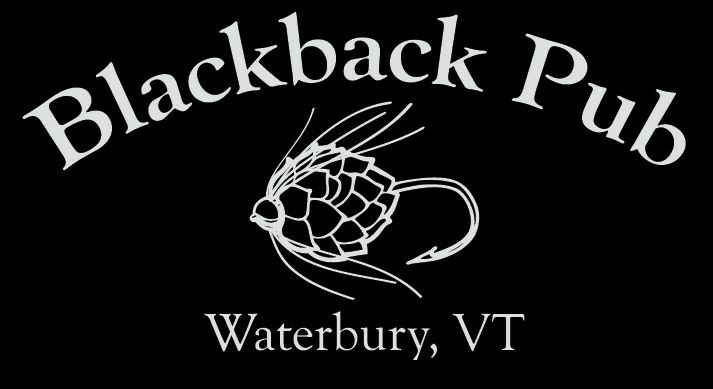 Waterbury VT is the Epicenter of beer in the Northeast and arguably one of the finest in the nation. We also recognize the important role beer has played in this towns recent history. From beer comes life and vitality which celebrates our localvore farm to plate business model. Fresh DIPA hopped with Galaxy, Enigma, and Citra. Double IPA with Citra and Amarillo hops. Plush is a double IPA that lays a soft mouthfeel and intense juiciness on your palate. Imperial IPA brewed with honey and oats and hopped with Simcoe, Galaxy & Nelson. IPAUtilizing Cascade, Amarillo, Simcoe, and Eukuanot hops, Spring has floral hop aromas amd notes of citrus, tropical fruit, and mixed berries. A milkshake style Double IPA brewed with lactose, oats and honey malt with peach. his hazy, hoppy and juicy Double IPAand is finished with Mosaic and Citra hops. Citrus and peppery spice balance its pleasant malt character. This beer is full bodied with a rustic, dry finish. Black lager that finds a perfect balance between chocolate and roast. Hill Farmstead Marie 5% $5/16 oz. we brew a beautifully soft, unfiltered and naturally carbonated German-style Helles. Lightly hazy, naturally carbonated and truly enjoyable, this is the beer we dream to have shared with Marie. Oxbow Infinite Darkness 10% Infinite Darkness is a Belgian-style imperial stout brewed with European malts and fermented with a blend of Trappist and farmhouse yeast. A sweet brown ale brewed with smoked malt. Brewed with lichen and mushroom. Tastes of lemon zest and herb.